Christine MacDonald quit school at the beginning of Grade 12. After that, her life began to spin out of control. She struggled with her schoolwork and became more disillusioned. When she quit school, she started drinking heavily. It all came to a head in the spring of 2013. Her grandmother died of cancer, and a month later, Christine overdosed. At that point, she realized that she was in serious trouble. She sought help for her addictions, and after completing an 8-week residential program, she started to rebuild her life. She began to consider what her job options were. A case worker suggested that she consider Trade HERizons, a career exploration project for women interested in trades such as carpentry, electrical, automotive, and welding. The course is free of charge to participants, and is run by Women’s Network PEI. In 2013, Christine and the other participants attended the program full time. In addition to participating in team building workshops, the women are taken to sample seven trades training programs offered at Holland College. Christine was especially interested in the college’s Wood Manufacturing/Cabinetmaking program. After completing the Trade HERizons program, Christine worked on a construction project for the Reach Foundation from January until August, and decided that she would like a career in the trades. 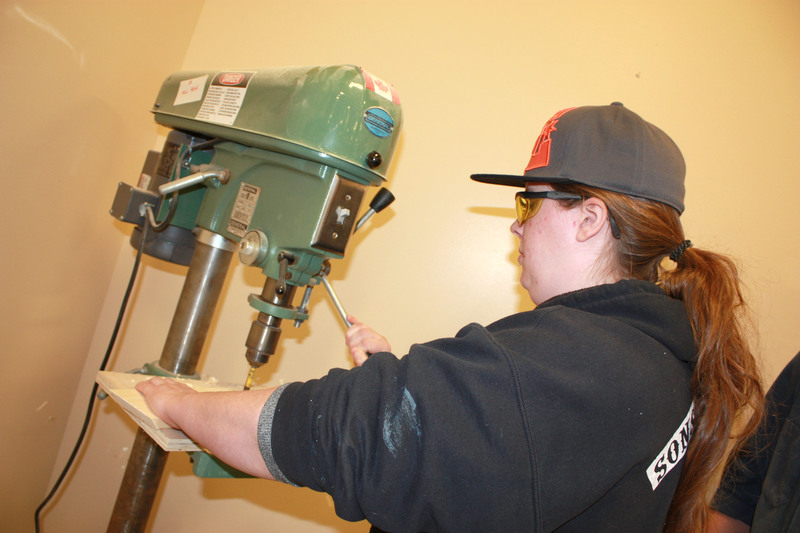 In September, with help from the Trades HERizons office, she enrolled in the Wood Manufacturing/Cabinetmaking program. “I like working with my hands and building stuff; but I wanted to work indoors, so this program suits me. It’s much more precise than carpentry,” Christine, who is now 23, explained. Graham Hicken is instructor of the Wood Manufacturing/Cabinetmaking program. He said he would like to see more women consider a career in this field. “There should be more women for a couple of reasons. First, it can make the guys step up their game, but more importantly because many women have natural skills that it takes men a while to learn, like attention to detail and manual dexterity. Most women already have those skills, some guys will never get them,” he said. Christine is not the first student who has entered the program after participating in Trade HERizons, and Graham hopes that she won’t be the last. The Trade HERizons program is currently looking for participants for the next course, which starts in January. When asked if she has any advice for women who are trying to break free of their addictions and move on with their lives, Christine quoted a friend. Christine still faces many obstacles, but she has proven to herself and others that a strong spirit and the desire to make a better life can overcome even the most overwhelming situations.